Murray and I dive a site called Yellow Hut this morning. 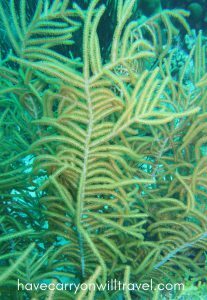 I knew it would be good when I spy Staghorn Coral on the swim out to the deep water. 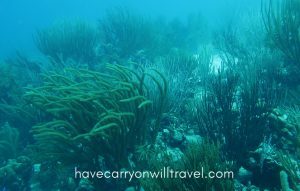 We descend to about 60 feet and we see a field of soft corals gently moving in the surge. It is a forest. As we travel south, this forest does not end but actually gets thicker. We stop and watch a small turtle munch away on a hard coral totally uncaring that we are observing him. We hang out with a barracuda and he seems to want to travel with us. OK, but I tactically place Murray between our new friend and me. We look for seahorses as we move through this forest, but do not find any. As we swim into the shallows at the end of the dive I am thinking we need to return to this dive site again. 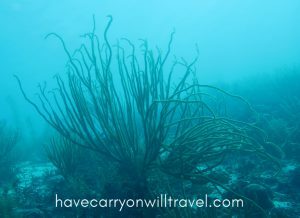 This entry was posted in Bonaire and tagged Bonaire, scuba diving. Bookmark the permalink.